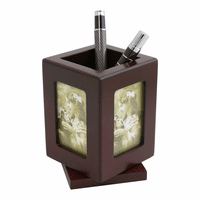 FEATURES/SPECS A perfect gift for a new graduate about to venture out in the world of business, this Twin Pencil Cup Desktop Organizer with Photo Frames can be personalized to commemorate that special occasion with the engraving of up to two full lines of text of your choice, in your choice of two fonts, at no extra charge to you. 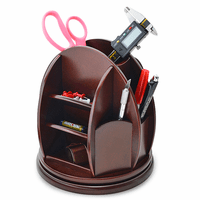 This personalized desktop organizer has a rosewood finish, twin pencil cups and a business card holder that has room for up to 35 business cards. It ships in one business day and comes packaged in a gift box. Dimensions: 11" x 3 7/8" x 4 7/8"
What size pictures does this hold? The frame sizes measure 2 1/8" x 3 1/8". What are the dimensions of the pencil cups? Is the inside at least 3 inches wide? The pencil cups are 2 1/4" wide and 3 3/4" deep. This came out beautifully- the engraving looked even better than I hoped. It was packaged well and arrived quickly without any damage. Would definitely order from this site again! I purchased this item as a gift for a coworker who was promoted. The quality is very good, the only downside is the odd picture size. Merchant Response:We're so sorry about that, it must have been damaged in shipment. We'll out to you via email about sending a replacement free of charge. 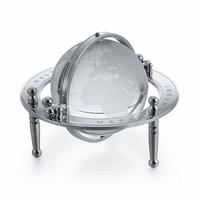 Bought this for my husband as a Father's Day gift & a new office warming present, and it is gorgeous & he loves it! Couldn't wait to put it on his desk. Shipping was fast and can't beat the price! ConsThe photo sizes are odd, requires custom printing! 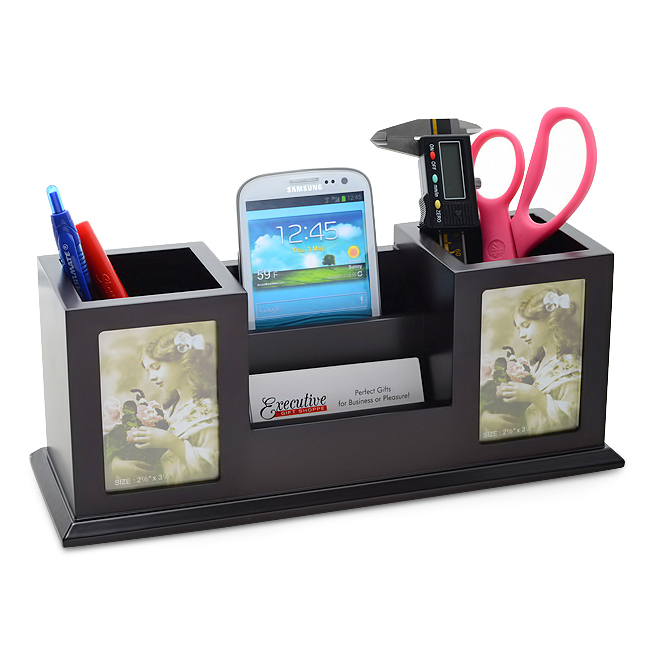 Very practical good size for a desk and the personalization feature was great!! Thanks Executive! 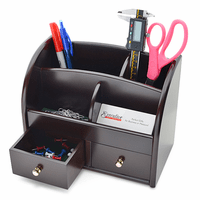 I bought this as a gift to myself to help organize my desk. It looks beautiful, my name engraving came out great too. I love it! I am very happy with this purchase. I was worried it may look cheap but it is high quality and a perfect gift for someone's desk. I wasn't sure if it would look more black or brown, it's brown with a cherry tint. We loved the design! Well built excellent quality..this was a present for my boss first one arrived chipped ..great customer service!!! We had a quick response and a replacement shipped right away..I give it 4 starts because second one arrived even a bit more damaged.. I'm sure this company will look into better packaging to resolve this issue as they have a good product..